This mean the Mac machine to router connectivity is 145 Mbps (Mega bits per seconds) which is approx 18 MBps (mega bytes per second). Also note that Mac and router are using 802.11n wireless networking standard. Open network utility and ensure that “Info” tab is selected. 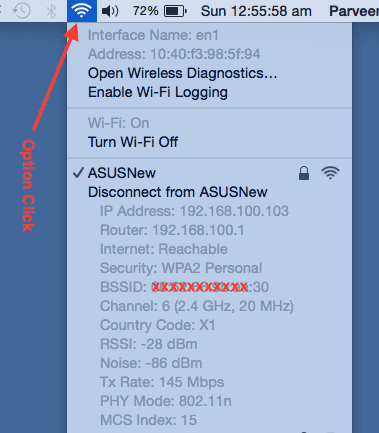 Select the correct wifi interface from the dropdown as shown below. 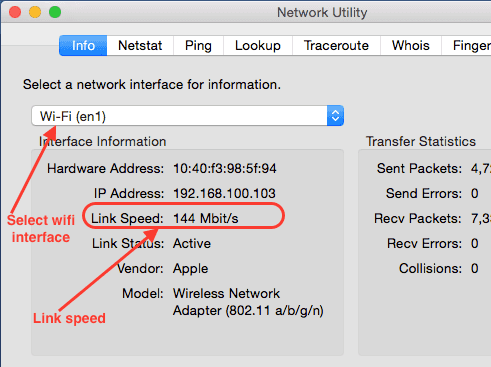 Then you should see the link speed from your Mac to wifi router. Usually you want to have a high link speed in your setup. That way the connected devices can communicate faster with each other.